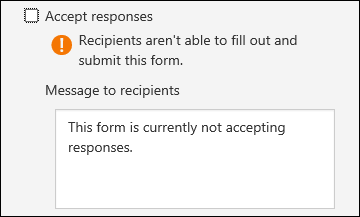 Set a time window for when you'll accept responses to a quiz or form, or decide when you're no longer accepting submissions. Change other settings to shuffle question order or open your quiz with Take a Test. Open the form or quiz that you want to manage. 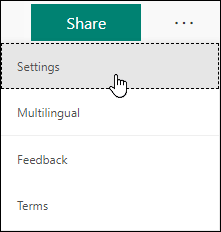 Select the More form settings icon ( ... ) next to Share, then select Settings. Note: The Share with people in my org option is disabled for consumers. Select Start date and End date to choose a time window when you will be accepting submissions for this form or quiz. If you want to turn off submissions for a form or quiz, return to Settings and uncheck the Accept responses box. You can also customize a message during this step. 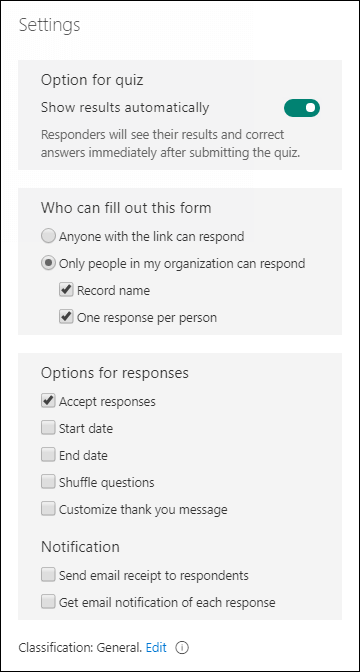 Follow the steps above and select Shuffle questions to display questions in a different order to each person who fills out your form or quiz. The default is for questions to appear in the order you've created them. Clears the clipboard to prevent copy and pasting. Turns off the ability to change settings, extend displays, see notifications, get updates, or use autofill features. After you select Open with the Take a Test app, the quiz link you share with students opens the Take a Test app on PCs with the Windows 10 Anniversary Update. The app requests that students sign in before accessing your quiz. Important: Students who don't have access to the Take a Test app will not be able to open your quiz.